Assemblymember Bill Quirk called Gov. Legislation that would have added criminal liabilities for those who willfully release metallic helium balloons at power lines was vetoed Monday by Gov. Jerry Brown. 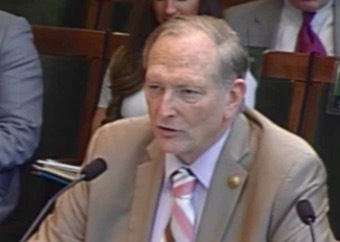 The bill, authored by Hayward Assemblymember Bill Quirk, however, was deemed by Brown as an unnecessary expansion of criminal law. Violations in Assembly Bill 1091 include a fine not to exceed $100, but also a threat of a misdemeanor for repeated offenses of the proposed law. But while Brown noted a problem exists, he added that criminal penalties are not the solution. “I do not believe that expanded criminal liability is the best solution to the problem of electrically conductive balloons interfering with power lines,” Brown wrote in a veto statement. Until Monday’s veto, AB 1091 had sailed through the legislative process without ever receiving a single no vote, including in committee. The impetus of the bill was in response to numerous power outages throughout the state in recent years related to metallic helium balloons, also called Mylar balloons, when they come in contact with power lines. According to State Senate analysis of the bill last month, Southern California Edison said more than 4,500 Mylar balloons had caused power outages in the region between 2011 and 2015. “There is plenty of data available that demonstrates metallic balloons pose a significant public safety risk. In the first seven months of 2017, over 100,000 customers have been affected by a power outage caused by one of these balloons coming in contact with a power line. I believe Governor Jerry Brown’s veto is misguided. However, I remain committed in working with utility companies, advocates and the balloon industry to find another solution to this problem,” said Quirk. Posted in AB 1091, AD20, Assembly, Bill Quirk, criminal charges, Jerry Brown, legislation, mylar balloons, power lines, power outages, utilities, veto. Bookmark the permalink. I am aware of two common methods to make balloons rise and stay aloft: one to fill them with helium; or two, fill them with hot air, and which is lighter than cool or warm air. However since most of the politicians in the state legislature are nothing but big windbags full of a lot of hot air, would it be illegal to use the extreme amounts hot air exhaled by those big windbags to inflate balloons we wanted to rise!!! In my above post I used the word feeling instead of FILLING. In other words, and as I have commented before, I am a horrible typist and also need to get a pair of reading glasses.